This app helps its users to manage popular cloud storage services such as Google Drive, Microsoft OneDrive, and Dropbox. After a few weeks in the rumor mill, Samsung Cloud Together is now finally available for download. This app works as expected, providing one dashboard that allows its users to manage a wide range of popular cloud storage services. The list obviously includes popular products like Google Drive, Dropbox, or Microsoft OneDrive. 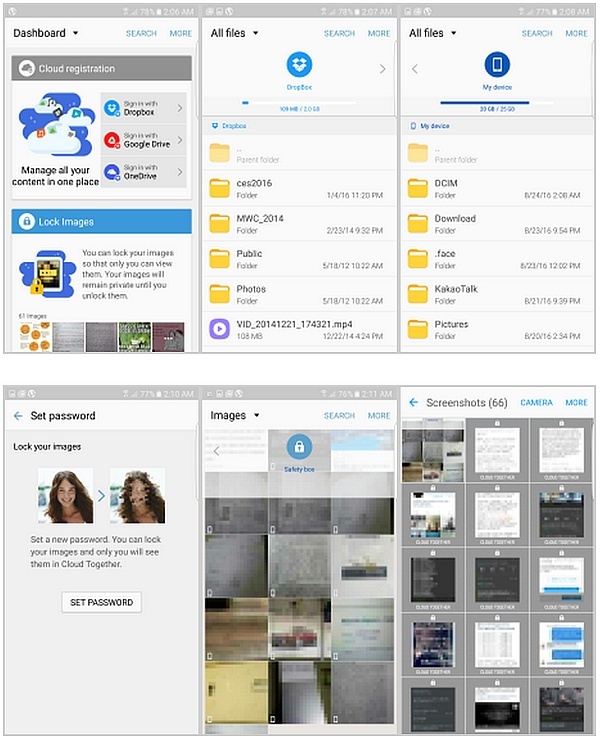 Samsung Cloud Together also acts as a local file browser, and one of its other features worth mentioning is the ability to lock images, securing them with a password. Once secured using Cloud Together, an image cannot be unlocked even when using Android's native Gallery app. Unfortunately, SamMobile's hands-on experience with this product has proven that Samsung Cloud Together has some speed issues at this time. According to them, "The lag is noticeable when it pulls in files from cloud storage services or unlocks a secure image." Since the app has just become available to the public, we have no doubt that its problems will be solved sooner or later.